12-year-old Jake Waters is mortified by his dad’s dream of opening the American Toilet Museum. Jake’s sick of hearing about antique toilet seats and vintage plungers. Toilets have caused enough turmoil in Patience, Kansas, already. You see, Patience is cursed. Has been ever since 1877, when Jeremiah Waters installed the first flush toilet west of the Mississippi. The Dolphin Deluge Wash-down Water Closet caused a mighty big stink, and since then Patience has been drying up like a cow pie in August. Jake wants out of Patience. Sooner than later. But when his father acquires an ancient toilet plunger for his museum, it triggers the curse’s last promise: “The day the Plunger of Destiny returns, the final destruction begins!” As clouds of doom gather, Jake is torn between the urge to run and the desire to do the one thing that might save Patience: solve the mystery of what happened the day Jeremiah Waters last sat in the water closet of doom. 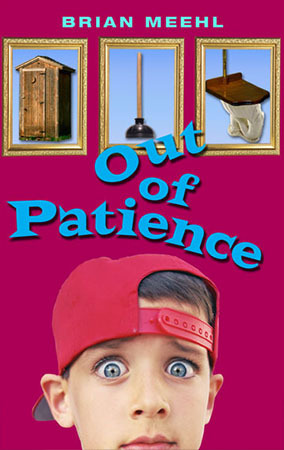 Join Jake and his friends as they try to flush out the truth in this twisted tale of pipe dreams and toilet trouble. Brian reads “It Came From Above” and “Take Me Out to the Stink Farm” from Out of Patience.